Lebohang Masango is a Master’s candidate in Social Anthropology at the University of Witwatersrand, South Africa. 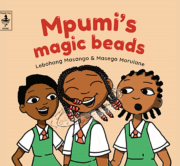 She is also a children’s book author of Mpumi’s Magic Beads, a poet, freelance writer and feminist activist. She has been published in Mike Alfred’s Twelve + One (2014) a poetry anthology of Johannesburg poets and To Breathe Into Another Voice (2017), a Jazz poetry anthology edited by Myesha Jenkins. Her poetry features on Hip Hop musician, Reason’s song “Endurance” alongside HHP in 2014. She was named as one of ‘Cosmopolitan Magazine: South Africa’s “Awesome Women” in 2016. Lebohang has performed her work at both national and international events while some of her academic work in Urban and Medical Anthropology will be published soon.